During the Comprehensive Plan Update, documents that are prepared will be posted to this page for download and review. 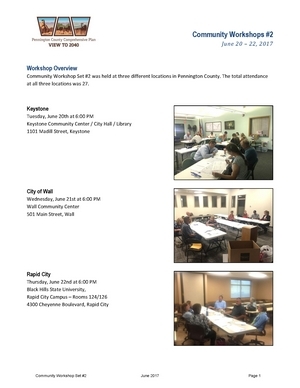 The Public Review Draft of the Pennington County Comprehensive Plan is the framework for guiding current and future development in Pennington County. This draft is now available for public comment. The Existing Conditions Report is made up of 10 chapters that provide a comprehensive look at the conditions and trends shaping the county. Click here to download a copy (about 30 Mb file). Click here to download Brochure #1. This brochure highlights the purpose of the Comprehensive Plan Update, the content of the Plan, and the process that will be used to update the County's existing Comprehensive Plan. Click Here to view the powerpoint presentation from the 5th Public Workshop. Click Here to view the 2040 FLUM Categories handout provided at the 5th Public Workshop. 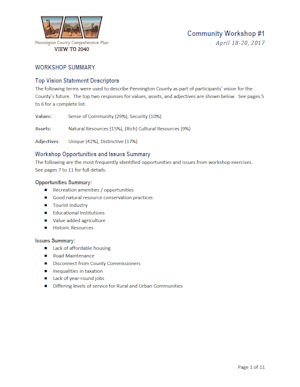 Click Here to view the Goals and Policies Handout provided at the 5th Public Workshop. Click here to download the summary of Community Workshop Set #2, which was held in the City of Keystone (June 20, 2017), the City of Wall (June 21, 2017), and Rapid City (June 22, 2017). Click here to download the summary of Community Workshop Set #1, which was held in Hill City (April 18, 2017), City of Wall (April 19, 2017), and Rapid City (April 20, 2017).